While the ‘winter’ may indeed be behind us, stark reminders of its dark legacy have a rather inconvenient way of making themselves visible. And so it was that amidst the debate and discussions that preceded and followed the budget, problems with fire safety in a residential building emerged. This time it was in Longboat Quay, an apartment complex in Dublin’s Docklands – once more a grim reminder of the unresolved inadequacy of the regulatory system in the construction industry during the boom. 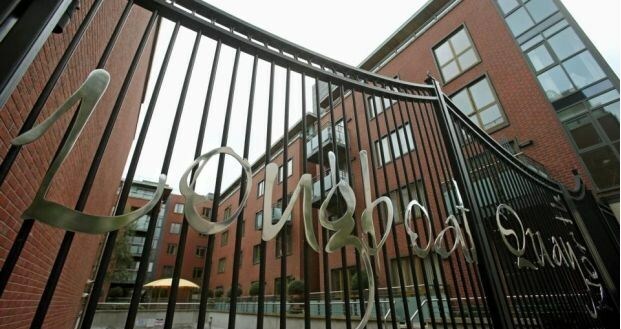 The 600 residents occupying 299 apartments located in Longboat Quay face a repair bill of €18,000 each, the overall repairs are estimated at €4.75 million. This development was built in 2006 by Bernard McNamara, who like so many of his developer colleagues massively over extended their portfolios. When the crash inevitably arrived he sought refuge in the UKs bankruptcy process. Consequently when it comes to fronting up for the repair work in Longboat Quay, McNamara will not be put upon, despite the fact that the apartment complex was built to a shoddy standard. A number of critical features were lacking: walls were not built with proper fire stops, important smoke vents were not installed resulting in a highly dangerous disregard for fire safety. These regulatory failures could have resulted in a tragedy of multiple fatalities given the numbers of people residing there. The issues in Longboat Quay have emerged just as another icon of regulatory failure, Priory Hall, is nearing the completion of the first phase of its refurbishment and is apparently being readied for market (although from a recent visit to the site it would seem that the development is far from finished). Priory Hall in North East Dublin is in many ways a monument to the years of property driven excess in Ireland. Built in 2007 by developer Tim Mc Feeley, it contains 189 apartment units and was home to 249 residents. However, on November 17 2011, the residents were evacuated when concerns emerged about fire safety of the building. This evacuation sparked a controversial saga that spanned the next two years, a period that saw the re-housing of the residents, the developer going bust, and the tragedy of one resident committing suicide due to the pressures of the situation. McFeeley, like McNamara, fled to the UK to declare bankruptcy. He was initially successful but it was later rescinded as court proceedings were taken against him in Ireland. He was subsequently declared bankrupt by the High Court in Ireland. Finally due to the sustained and determined campaign by the residents of Priory Hall for justice a deal was reached whereby the owner occupiers had their mortgages written off and owners of buy-to-let properties were given a moratorium on their mortgage payments. The overall cost of refurbishment is estimated at €27 million, borne by Dublin City Council – although the owner occupier apartments will be sold to recoup some of the cost to the council. This is a tale symptomatic of the crash, whereby the state is required to step in for the failures of the private market. 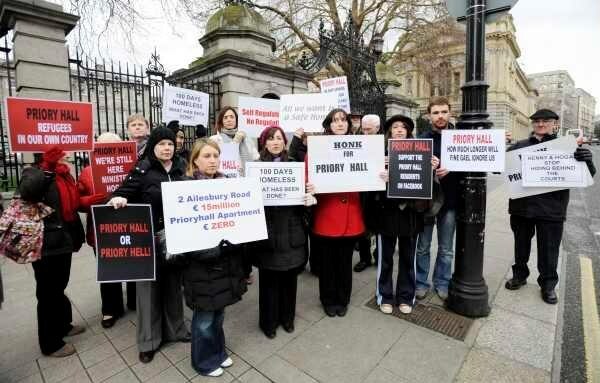 The hopes and aspirations of most of the former Priory Hall residents now lie elsewhere. 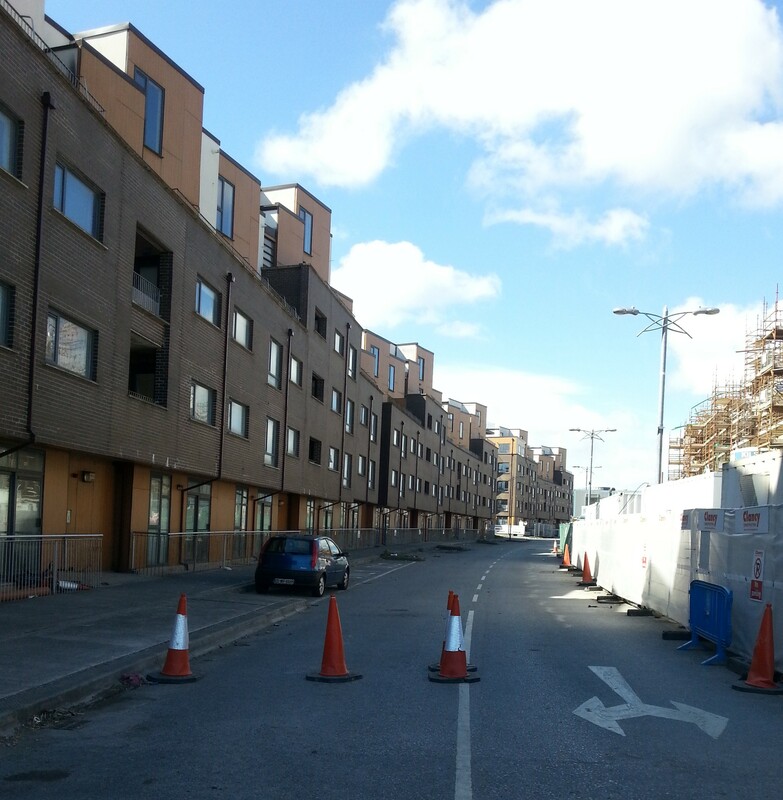 The Priory Hall development is slowly being re-launched. Interestingly the name ‘Priory Hall’ is notably absent from advertising hoarding surrounding the redevelopment works and now the name, and its sordid story, seems consigned to history. Longboat Quay, Priory Hall and other developments such as Riverwalk in Ratoath, County Meath that have come to light thus far, pose the question: are these simply isolated or coincidental examples? The geographic spread and the different developers involved would suggest that coincidence is an unlikely explanation. The other common factor they share is that they were all built in 2006-2007, the final furlongs of what had been a marathon of building frenzy in Irish property development. The reality is that these developments illustrate a more generalised problem with the certification of building regulations that was particularly exposed in the building frenzy of the Celtic Tiger. It also reveals both the failure of the state’s enforcement powers but particularly the unwillingness of the state to monitor and control private development in any meaningful way. The foundations of these regulatory failures were laid in 1990 when the building control regulations were relaxed by the then Fianna Fail Minister for the Environment, Padraig Flynn. This represented an attempt to remove obstacles that would be seen as a disincentive to the construction industry. It also reflected broader changes aimed at enticing and encouraging private finance into urban development, such as the introduction of the Urban Renewal Act in 1986 and the Finance Act in 1987, which used tax incentives and financial inducements to encourage the private sector. In a further illustration of this new founded entrepreneurial ethos by policy makers this period also heralded the establishment of the IFSC and its new low corporate tax structure. The easing of building regulations represented a system of light-touch regulation aimed at speeding up and facilitating construction projects. However, it was a move that has proven to be a disaster for many people in the ensuing property frenzy. Annual housing construction output increased rapidly in the boom, reaching a phenomenal 93,419 housing units in 2006. Local authorities are responsible for the monitoring and enforcement of the building regulations. They simply did not have the staff to effectively monitor this scale of construction nor were they provided with the financial resources to recruit more personnel. Hence there was little independent oversight of building standards, meaning in effect a system of self certification existed whereby an employee of the developer could sign the certificate of compliance. The consequences of this model is plain to see in Priory Hall and Longboat Quay. There has been no national audit of the quality of the residential construction undertaken during the Celtic Tiger, so given the short cuts and shoddy practices that have emerged thus far, it is not unreasonable to suggest that many more properties could be at risk. In 2014 the regulatory situation was tightened under the Code of Practice for Inspecting and Certifying Buildings and Works. The technical documentation that accompanies developments on commencement and completion must now identify a person in the design team as an ‘assigned certifier’. This individual must be an architect, an engineer or a surveyor who is named and can be held responsible if issues arise at some future point. Clearly this is welcome but it is not without its problems. Firstly, there is no obligation for the assigned certifier to be independent of the developer or the project and secondly, concerns have been raised that the indemnity falls on the shoulders of the ‘assigned certifier’ who in reality is signing off on a project on behalf of the builder – meaning that they can be the ‘fall guy’ between the builder and the consumer. These changes don’t mean that a new Priory Hall couldn’t re-occur. In many respects they are attempts to deal with a situation if and when a problem arises. There needs to be more emphasis on prevention under the guidance of some form of Building Control Agency which would maintain independent oversight. Responsibility is critical but someone being held responsible after a person or people have died is, while worthy, scant consolation to people potentially left behind, as is all too graphically illustrated in the recent tragedy in Carrickmines. Michael Murphy is a PhD candidate in the Department of Geography at Maynooth University.